Out of Oz: Why did the turkey cross the ocean? This is the obligatory Thanksgiving-in-a-foreign-country post. But you'll find out more on that in a minute. First up, this past weekend. It was a roller coaster for me and, as any good weekend should, taught me a lot about what I want my life to be like here in Oz. The highlight of the weekend was our regional youth activity. The church in Ireland is not huge. There are 2 stakes, one centered in Dublin and one in Belfast. Then there's our district based out of Limerick. The activity was all day Saturday and involved youth 14-18 years old from all over the island, about 120 all together. It was a hoot seeing them all together. Carpools from the south and west came along with buses full of kids from the north and dropped kids at our church building around 9:30am. It was pretty much all go from there. Morning speakers, games and a service project, lunch, seminary (a kind of Sunday school), a talent show, dinner and lastly, a dance. Scarecrow and I were there consistently from the beginning till the end. I counted and by the end of the day (we left and came back after the dance) I had sat down a grand total of 4 times. But I loved every bit of it. I can't wait till next year when Toto is old enough to go to these kinds of activities. It was great to see how much the kids care about each other, how close they are despite the distance. I loved meeting other leaders from around the country and getting to know them better. Scarecrow and I had a great time and really wished that a lot of people lived a lot closer. Church on Sunday was great, the little primary kids had a program which is always an uplifting thing. Our lesson in Young Women's was great. But when we got home I just found myself getting overwhelmed and frustrated at little things that normally wouldn't bother me. Scarecrow proved yet again why I love him so much and just let me cry it out. And contrary to every male stereotype, he knew just what to say. Everything always seems brighter and better after a good solid cry. And wouldn't you know, Monday was even brighter. I got my gang out the door that morning, went upstairs to work for awhile, and was greeted when I came back down by a package! A lot of my amazing friends have been asking me if I need anything for Thanksgiving. I've felt really loved at all of the offers and had said I really don't need anything. I know how much it costs to ship things over here and didn't want to put anyone out. One sweet friend never even asked, just surprised me with a fabulous treat. Leslie, one of my oldest friends from way back in the day, sent a couple little things to make it feel more like Thanksgiving. And so, why did the turkey cross the ocean? To get to the other side, of course! Scarecrow was pretty amused by that one. So now Oz has perhaps the only set of turkey salt and pepper shakers along with Thanksgiving tea towels and Leslie's favorite Thanksgiving movie, Son-in-Law. She's also a great reader, something we share, and so she sent me a book she thought I would like. My mother-in-law got a good laugh when I pulled these things out. Clearly it's not a holiday that gets much attention outside of North America. Toto has been asking if we get presents for Thanksgiving. I'm learning it's a hard holiday to explain. Last night we went and did the shopping for the trimmings. I'm feeling a little intimidated at what I've gotten myself into cooking wise. I actually like to cook, don't get me wrong. But my reputation precedes me. Not to mention I'm nervous to be introducing so many new things to my Irish family. They've been good sports about the whole thing, not even just Thanksgiving. When I cook it's not in the way they're traditionally used to. No one has ever complained, but I don't want to go pushing people too far out of their dietary comfort zone. So next week you'll see if this holiday got pulled off or not. Lastly, had a nice night out a few nights ago. I went and caught a movie with a couple of girls. And not just any movie, Breaking Dawn part II. Oh it was good! It was sad, not the movie, but during a part of it I almost cried when I realized that I wasn't seeing it with my MoH, my Meg of Honor. 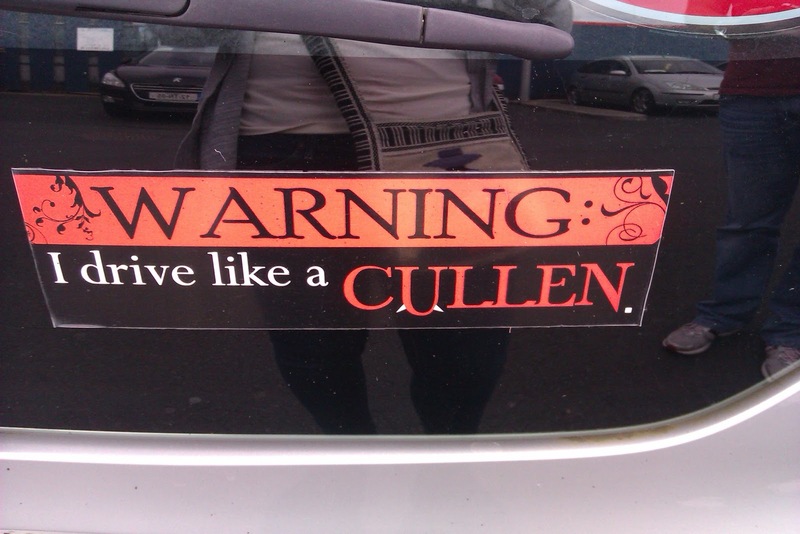 I saw this bumper sticker a few months ago, not too long after I moved here. I'd been meaning to post it but I think it's more appropriate now. Have a happy Thanksgiving everyone. I'm celebrating with the newest extension of my family and I'm very excited to be able to do that. I'm grateful for them and for all their love and patience as I've learned to adjust here. I'm grateful for Toto and how sweet and funny she is, even in her teenager moments. I'll always be thankful for my Scarecrow. Do you know why I call him the Scarecrow? Do you remember at the end of the Wizard of Oz, right before Dorothy leaves Oz and goes back to Kansas? She's saying good bye to everyone and she turns to the Scarecrow and says, "I think I'll miss you most of all". He was her best friend, the one she felt like she couldn't have made it without. This ruby slippered girl feels the same way. Are you ROASTING a Turkey?